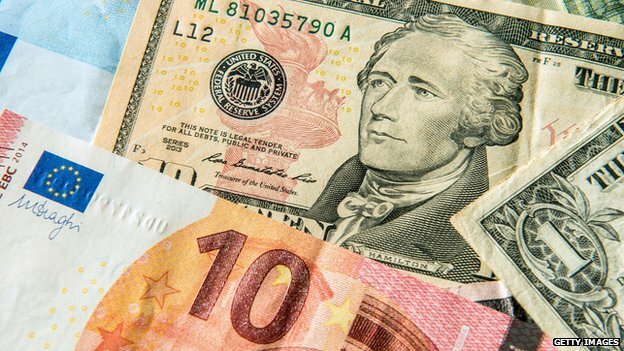 The euro has fallen to its lowest level against the US dollar in 12 years after the European Central Bank (ECB) began its government bond buying programme. It fell as low as $1.0560, before recovering a little. But many traders expect it may soon be worth the same as a dollar. The ECB began its latest round of quantitative easing (QE) on Monday. It will buy bonds worth €1.14tn over the next 18 months, flooding the market with euros. Traders have reacted to the ECB’s latest round of QE by selling euros and buying other currencies such as US dollars. The US currency is appealing because the Federal Reserve looks to have completed its bond-buying programme. The euro started its slide against the dollar in July last year as traders reacted to the divergence in policy between the ECB and the Fed. The value of the euro has fallen 22.4% since 1 July, when a euro was worth $1.37. An upbeat US jobs survey released on Friday provided an additional boost to the dollar. “This opened up speculation again that the US will raise interest rates in June,” says Jane Foley, senior currency strategist at Rabobank. This would attract foreign capital and boost the dollar. In the eurozone Greece’s economic woes continue to put downward pressure on the euro, bringing it closer to dollar parity. The eurozone’s growing current account surplus is encouraging Europeans to invest abroad causing the euro to weaken further, according to Deutsche Bank.